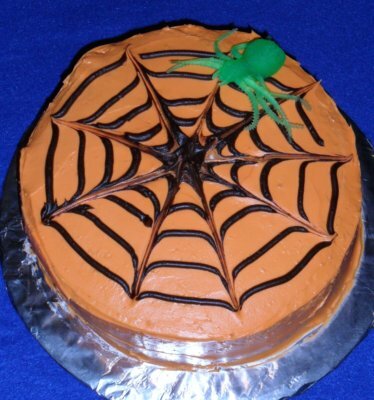 This is a simple spiderweb cake that would be perfect for a Halloween party cake, a Charlotte’s Web party cake or for a Spiderman party cake. 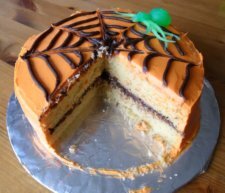 It is made with a regular cake mix (could use any type). Bake the cake in two 8 inch cake pans. Once the cakes are room temperature level the tops. This will help create a straight level cake. In the center I put a layer of chocolate icing. For the outside of the cake I made orange icing from vanilla icing. I used the Wilton orange food coloring. I then iced the cake the solid color of orange. I used orange icing, but I think that it would looked great blue, green or even hot pink icing. Next, I filled an icing bag with chocolate icing. Using tip #9, I made a coin sized circle in the middle of the cake. Then I made some regular larger circles. Finally I used a spatula and dragged it through the icing. 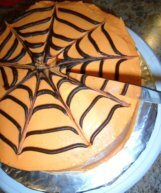 This made the icing look like a spider web. I was surprised how easy this technique was for how good the cake looked. I then placed a toy spider on the top of the cake.